Founded by Congregationalists, this college--site one mile north, 1890-1922, achieved renown in education and character-building. It lives on at the University of Oklahoma as the Kingfisher College Chair of the Philosophy of Religion and Ethics. One mile East of Kingfisher on OK Hwy 33. Marker south side of road. Kingfisher College was a college in Kingfisher, Oklahoma from 1895-1922. First opened in an old hotel in Kingfisher on September 2, 1895, the college was the 42nd with ties to the Congregational church in America. Enrollment was increasing until World War I, when it sharply fell. The college was forced to close in 1922, due to declining donations and cheaper tuition at schools such as Central State Normal School. The Pentecostal Holiness Church bought the site, where King's College was open for ten years before closing. The college waited until 1976 to be added to the National Register of Historic Places. The records, degrees and library holdings were transferred to the University of Oklahoma, per a 1927 agreement by the Kingfisher Board of Trustees. 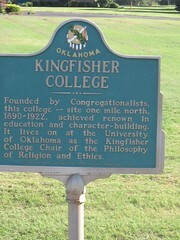 The Kingfisher College Chair of Philosophy of Religion and Ethics was created at OU in 1951 after a thirty-thousand dollar endowment. Thirteen years later, the entire endowment fund was transferred to the University of Oklahoma.